Background: Laparoscopic Cholecystectomy (LC) is performed by an astonishing variety of techniques, yet the frequency of biliary injury remains high, and up to 25% of urgent cholecystectomies are performed by open approach. Laparoscopic biliary intraoperative ultrasound (IOUS) allows for identification of biliary anatomy before division of or damage to any structure, but is underutilized. 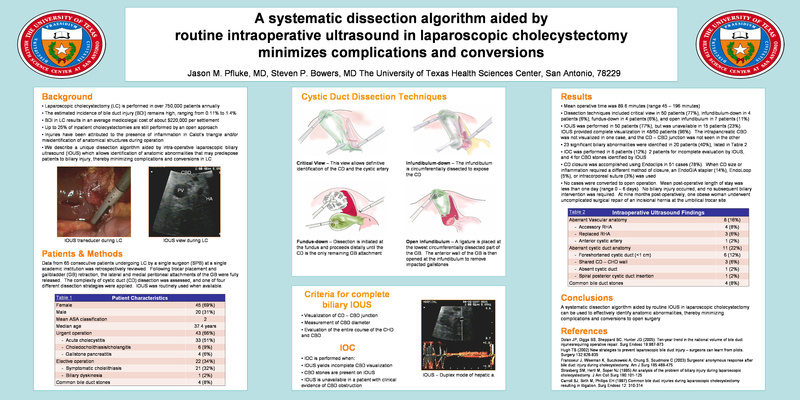 The authors report use of a systematic dissection algorithm for laparoscopic cholecystectomy, aided by routine IOUS. Methods: A retrospective review was performed of all patients who underwent cholecystectomy by a single surgeon at a single academic institution between January 2005 and May 2007. Of the 65 patients, 43 (66%) had an urgent operation and 20 (31%) were male. IOUS was used in 50 patients. Mean age was 37.4 years and median ASA class II. All patients underwent laparoscopic approach.